Students registered in a course are automatically added by Moodle, but teaching assistants and mentors need to be added manually to the course. Picture 1: Enroll User link. 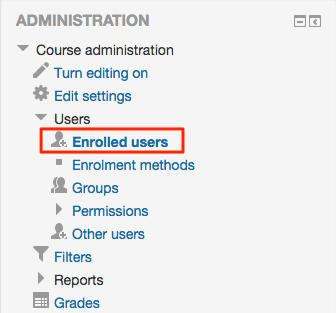 Click the “Enrolled Users” link under the course name in the Administration box (see picture 1). On the next participants screen, Click the “Enrol users” button on the right. Set the role you want the student to have in the drop-down list next to “Assign roles” (see picture 2): TAs who can upload content and can grade assignments, should be given the “Teacher” role, TAs who can upload content, but cannot grade, can be given the “Non-grading TA” role (Note you cannot apply the Non grading TA role yourself, you will need to contact your Instructional Technologist and ask us to apply it for you). Enter a student’s name or email in the search field (see picture 2). When done, click Enrol users. The students you just added should now appear in the participant list.